Balloon Glows, custom designed based on budget and site locations, create a show-stopping experience that is a unique visual experience for your event. You can have one balloon, two balloons or over a dozen or more. 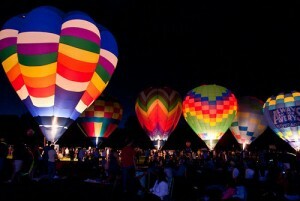 The balloons can perform a variety of burns creating a beautiful nighttime presentation from full burns to twinkle burns that can be synchronized to music. The sky becomes illuminated by the balloons glowing in the dark sure to cause a stir at any event guaranteed to make your event a truly memorable one!